Greetings future mathematicians ! Take advantage of all yr opportunities. Jolly forth ! At the beginning of the semester Irina Paramonova said that the goal of the program is to teach students to love mathematics and to love Russian culture. The program is great at teaching students these things, and I am thankful. However, I would also encourage students to hold these goals as top priorities for themselves. I was only able to get the most out of this programs when I was motivated by these passions. Hi ! There is a really fantastic Math culture here at MIM, and I’m really grateful to have taken part in it. Algebra forever ! Math in Moscow is an exceptional program. Professors are really top notch and you will learn so much wonderful mathematics. Moscow is a beautiful city with plenty to keep you busy. Just make sure you go out and do it ! You’re going to get out what you put in, so if you come make the most of it. There is more than just math here so keep it in mind. Be open to your roommate &amp meeting new people. This program is great if you’re an algebraist. Most professors are. I really enjoyed my time in Moscow with MIM. This is a unique opportunity to meet and get to know a group of brilliant and very interesting students. Classes are super exciting, and professors are accessible outside of class. Moscow is beautiful, and trips to St. Petersburg and Suzdal were awesome ! Salut ! Math in Moscow is intense, the math is hard, the lectures are long, Russian is a difficult language but I didn’t regret a single second of it. It is an incredible opportunity to grow as mathematicians and people. I met great friends and learned fascinating mathematics. Math in Moscow was an incredible experience. I really enjoyed the small, intense classes. I particularly enjoyed the fact that it was so easy to setup an independent study. All of my classes and especially my independent study on complexity have really triggered my curiosity. Thank you ! If you love math, you should definitely come. Awesome choice from very challenging to intermediate courses. 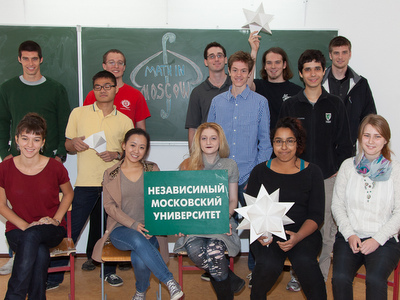 It will also be a blast to live with such a talented and interesting group mathematicians, but don’t forget to meet some Russians while you have the very fine opportunity to be here. It is best to learn some Russian for at least couple of weeks before coming so that you can at least talk about the weather. I assure you your time here will be enormously rewarded in your personal growth. It is so far the best mathematical experience I have ever had. All the professors were professional mathematicians who motivate you to study mathematics. They try to make sure you are able to solve the problems, and not just have a vague understanding of the theory. I found it’s very true many times when they said ” the devil is in the detail”. My advice is to take fewer math classes, talk more with professors and try to go beyond the curriculum. Also, make sure you take the trip to Suzdal. It’s short, fun, and contains some surprise! To be honest, before the semester began I felt very intimidated by the idea of learning math “the Russian way” and studying in such an excellent university. But once I arrived I found that the people were very welcoming and I found my place amongst other students. It was really awesome to live and study with my classmates – great mathematicians and great friends. I’ve learned so much about mathematics and about life while being here.